Seabed Secrets. We just love water itself. The ocean plays an integral role in everything we do: from the air we breathe, to the water that we drink, to the climate and weather patterns that dictate our lives and livelihoods. Yet we have explored only 5% of the Earth’s ocean water, an ocean that encompasses more than 70% of our planet. Today we discover what it takes to be a marine scientist. Marine scientists research the sea and study its interactions with its organisms, sea floors, coastal areas and the atmosphere. Marla is a marine scientist and one of those people who are in love with their jobs. She carries out scientific research and study on all aspects of the marine environment, but her specialty is the exploration of the seabed and the discovery of new marine species that live in the deep in the sea. This covers all plant and animal life forms, their habitats. Marla arrives today on a new location that has never been reached. Her ship and her old submarine in the style of Nautilus are ready for new ventures. Let’s help her research the new place and find out what secrets it hides. 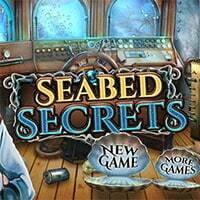 Seabed Secrets is a free online hidden object game on Hidden4Fun.